Solid wormy hickory edge grain butcher block style top with a mirror coat epoxy resin finish. 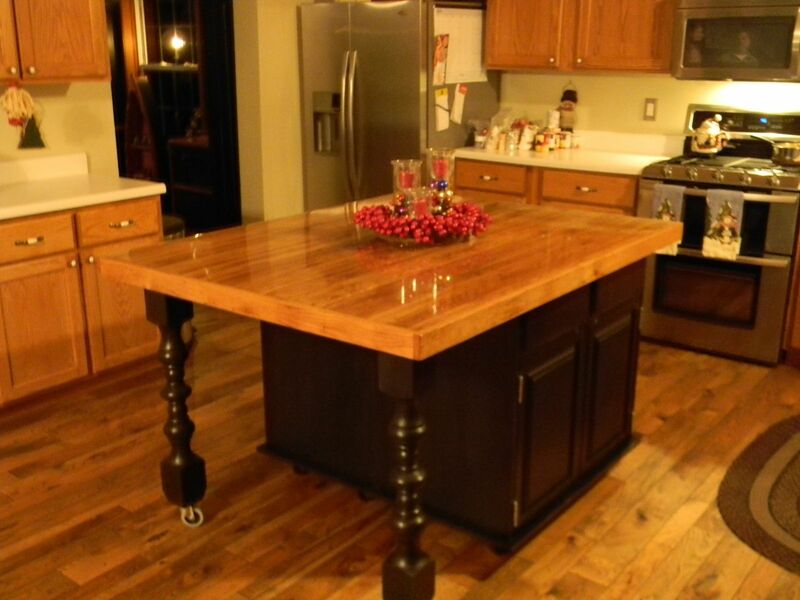 The legs are solid oak custom turned with four concealed brackets, and swivel locking caster. The cabinets feature solid oak recessed panel doors with bullet catches 4 half blind dovetailed drawers with full extension drawer slides with solid hickory drawer fronts and 4 caster per cabinet unit. Door and Drawer handles are to be installed by the customer but can be included. The island can be disassebled into five pieces: The top, two undercabinets and two legs. The tools required for assembly are a screw gun and #2 a #3 phillips. Shipping cost may vary depending on location. Installation can be included depending on location. Dimensions: Dimensions can be made avialable upon request. Pricing may change depending on sizes and specifications.